Somebody once said porridge is for poor people (this statement can offend many people), and his dinner sometimes looks like "poor people's food". Puh-leese, poor people don't even have food to eat. Your mum cooks dinner for you, so just appreciate it. You know who you are. Read mine. 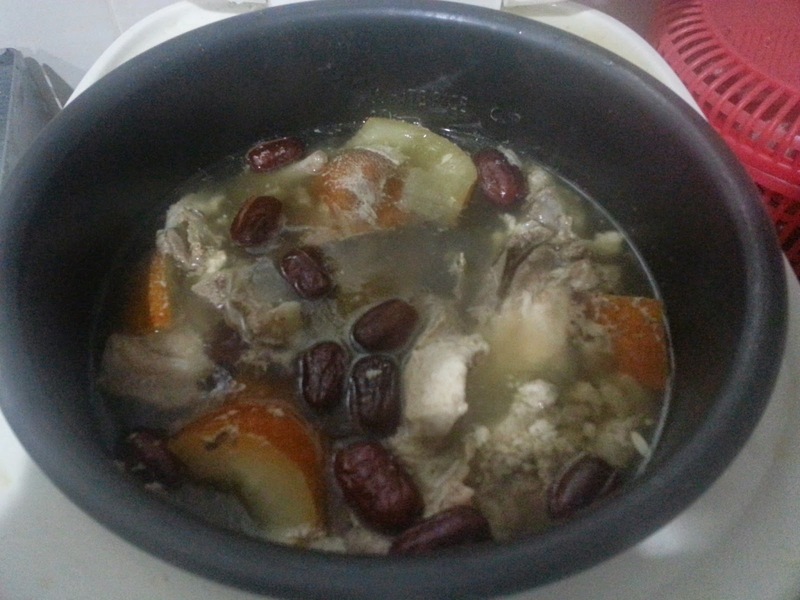 Once a week, I boil soup (in the rice cooker, after I rush back from work) - for next day's dinner. So the next day, I only boil rice, and have that with soup only. On certain nights, when I'm free after dinner (before I sleep), I'll cook a simple "one-pot" dish (yat wok sook) and keep it in the fridge - for next day's dinner too. So the next day, I just boil rice, and eat this "yat wok sook" dish only. Sometimes, the dish can last for 2x dinner. When I'm on leave or if I don't go to work, I'll cook one extra dish. Chin tan (fry egg), chau choy (fry vege) and maybe one ginger chicken dish. Simple dishes only. By the way, I bring my own lunch to work, no fancy lunch outside. Ok, maybe once or twice a week, that's it. But most days, lunch in the office from dinner the previous night. I don't go out as often as you for lunch. From your post, you eat out everyday. Look at my lunch. Rice (with some furikake), vegetables and some meat only - from last night's dinner. Sometimes, if I'm hardworking, I'll make breakfast for lunch. 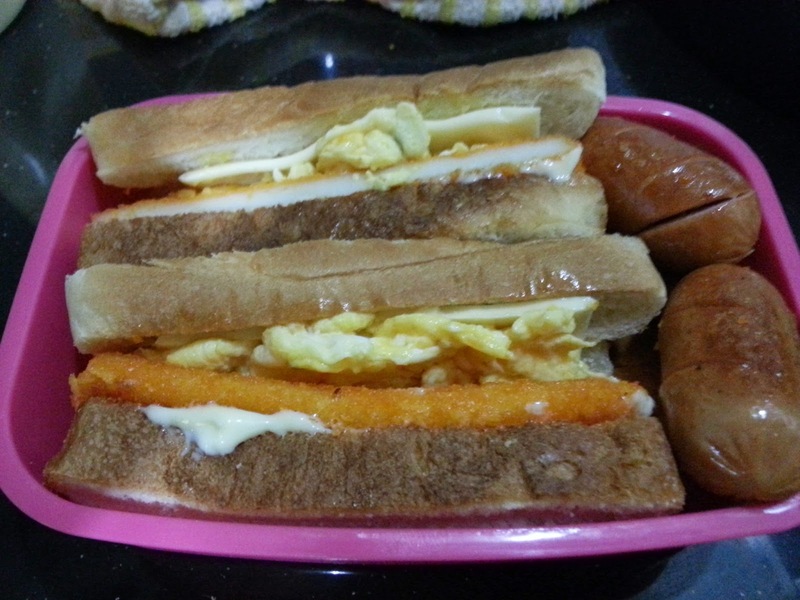 Bread with egg, cheese, maybe fry some fish fillets and sausages as a treat once a while - I keep these for lunch while I have a cup of Milo only for breakfast. Ok, now come weekends. While you are busy going out with friends or eating out with family, I stay home and cook one-pot dishes again. 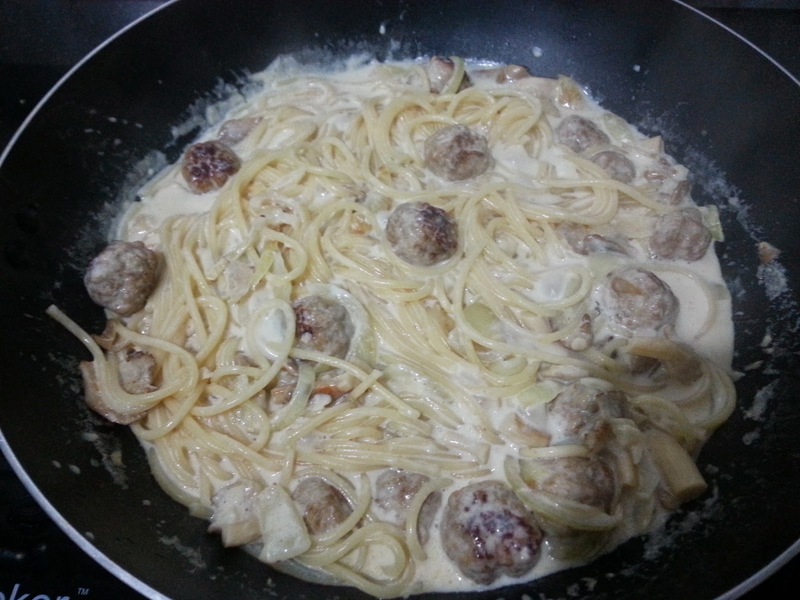 Like this simple spaghetti. Or fried rice with ham and eggs only. Hubby never complains about the food I cook. The rule is: I cook what, he eats what. Oooo...your sandwiches look good! Nom...nom...nom.... Your fried rice looks like mine. I would say you're a VERY good cook. That dinner gets my double thumbs up...and the leftover meat in your lunch box - yummy leh!!! Ya, we eat a lot of leftovers too as only two of us in the house...and my missus cooks the same way she did before she got married - she has standard recipes for her whole family, 6 of them! STP - Yes, I follow your way of frying rice.. Push the rice to the side (or don't throw in the rice first), crack, cook and stir the eggs until they are cooked a bit, then only mix in the rice. This way, the rice don't get mushy (lam pet pet).. Great tip..
Xiao Ying - Haha, paiseh.. I eat a lot of leftovers, almost everyday. Most of the time, I bring lunch to work. Only once or twice a week, I follow the guys out for lunch..
Of coz don't complain la, so smart to make complaining, go cook yourself then!!! I not as canggih as SK, know how to put the "like" or "love" button here, but thanks for your comment.. Tonight cannot sleep, dream of you.. But honestly, I eat a lot of leftover food, sometimes can drag 2-3 days, dunno ok ger mou, I heard it's not good for health, but no choice..
Super like your comment.. I tell Kz the same thing too when he doesn't eat.. So many people out there don't have food to eat la.. By the way, my fridge has many leftover food now, coz MIL gave some, my mum gave some, so I think the food can last til Tuesday-Wednesday..
Yah la!! We got so free and easy, need to wake up so early then go to work, then after work got to "work" at home also...can't just say "if you want you make some times out, right?" how about the housework and kids, need to jaga, jaga a bit!! After they sleep they we-self need to sleep too, and it was almost 10pm or 11pm already, if not don't sleep how to wake up on next day around 5am...right?? Morning Louiz! I also super like or rather super love this post! I like to know what other people eat at home. Though your cooking may be simple, it is good and homely type of dishes. I salute you for cooking after rushing home from work. I can't do that, or rather I won't do that as I am not in the mood. Like you, I can eat leftovers for a few days. What I do is cook one big serving of a dish or soup and then eat it over the next four days for dinner. Not many people can tahan like that but it works for me, I tried bringing leftovers for lunch (obviously inspired by your earlier post) but don't taste nice as I don't have a microwave in the office. So I gave up liao. But I do feel like starting again. Even if the food is cold, at least it is home cooked. I intend to buy a freezer and then I can cook and freeze dishes like curries. I love all your dishes up there especially the fried rice. I'm like you too.. But I don't cook a big batch during the weekends coz MIL will usually give food on Saturday, and my mum pulak will give some food on Sunday.. So MIL+my mum's food = food for the next 2 days..
We only cook simple food on Wednesday onwards.. Like chin tan, chau choy and steam fish.. No time to cook fancy food la.. So at night, before I sleep, say, around 9-10pm, I'll cook something (a meat dish most probably), cool it, and put in the fridge.. So the next day after work, we just heat up that dish, and boil rice, kautim! Then come Thursday - open a can of Campbell oxtail soup, boil some spaghetti, fry an egg? Friday - buy a loaf of bread on the way back from work, open a can of Spam or luncheon meat, slice up some tomatoes, cheese.. That's about it..
That was what that person said, behtahan him, so I write this post lor.. Simple food only babe.. Leftovers mostly.. Then pack for lunch the next day.. The tip is use cold rice in the fridge.. If you don't have "kak yeh fan", then cook a pot of rice, cool it, and put in fridge for 2-3 hours before you cook..
And also the egg.. STP's tip. Don't crack the eggs when you are frying the rice and mix it together, else, the rice will be mushy.. Fry the eggs first, then only put in the rice.. I love STP! I used to hate porridge but as I am getting older, I enjoy them. Hehe. Must be that I am poorer now. Lol. Nice homecooked meal you have there. I seldom cook on Sunday as my Jamie is so clingy to me. The "porridge is for poor people" didn't come from me, it's from some other bloggers and I can go mad reading his posts everyday, so I'm "dedicating" this post to him.. Who says porridge is for the poor? Not cheap if eat porridge outside leh.. Sometimes, I have to cook a big batch on weekends (if we don't go to my MIL's or to my mum's), then divide into a few portions, and freeze.. Then we can have home cooked food after work on weekdays, just fry some eggs and vege enuff..
Heard of this phrase before. It is cheaper to cook porridge than eat out. You can add whatever you want at home. I can hardly cook 2 meals at 1 go, because I will usually end up taking 1.5 servings, then feel "not up not down" with the remaining 0.5 serving and end up finishing them as well. So nowadays I try to control, 1 portion per cooking. Yeah, I un what you mean, it happens to me all the time too, but I'm not worried coz I can pack it to work for lunch the next day.. But I guess guys will not pack food to work hor..
Porridge is good la...healthy but can get hungry very fast. Yep, I love porridge too.. I cook porridge almost every weekends.. Sometimes it's oysters+scallops.. Sometimes it's fish+carrots.. Sometimes broccoli+potato.. Sometimes pork/chicken, tastes so good in any ways..
Agree la, I also won't know how to cook abalone seafood porridge la, better eat out.. I only cook "come" cook "go" a few porridge nia - oysters+scallops, potato+broccoli, fish+carrots, meat/chicken+carrots or pumpkin.. Same thing nia..
hmmm, so you always cook your dinner a day before and then when you reach home, you reheat again to be served the next day?? errr, i know you have time issue, i know you are busy, i know that would save your time and is more convenient lah.. but then eating too many reheated overnight dishes also not good leh.. for health purpose, and i also think you are a very efficient cook (since you also cook one-pot), why not just spend a little more time before dinner after you reached home, and cook the dishes on the spot leh?? sorry ah, maybe i am thinking it too simple only..
Actually, yeah, I also know eating too much leftover food or reheated food is not good, can cause cancer.. But sometimes hor, cooking for two (minus that picky eater), a bit susah leh.. If got leftover, to throw, macam so wasteful.. So I just pack to work the next day and reheat in the pantry lor..
About reheating the food at home, errrr, maybe 2x a month, when the MIL or my mum didn't give food, then I'll do like that.. If MIL or or mum give good to take home, then I don't do too much la.. But yes, staying up late and cooking one dish before I sleep, and reheat that dish to eat the next day, I do quite often wor..
good lah, you have a hubby that never complain about your cooking, but just eat.. though i know you have to picky kids who never complain probably, but take that by action by not eating any, haha!! but i saw that milky (or murky) spaghetti with balls, i sure know those are for your kids since they love it so much.. your lunchbox actually looks good woh, and your fried rice also.. fried rice actually simple simple also nice geh, as long as got the wok hei and the rice all separate in grains.. fried rice is surely a good idea for lunchbox lor, simple and convenient and nice..
My lunch box is mainly dinner from previous night.. Sometimes when I'm hardworking, I'll wakeup earlier, make bread, fry fish cakes, sausages, scramble some eggs, then pack it as lunch for the day.. I'll save it for lunch, and only have a cup of Milo (with soda peang) for breakfast lor..
Btw, your lunchbox looks good and i am envious that your hubby eats what you cook. Mine is a fussy eater. But for health reasons [cancer scare], i was told that food that are cooked for more than 12 hours and re-heating those food are not good for our body. So, i have to cook daily in the mornings after my 40-min walks [super rush as i need to be in the office before 10am and the journey to office is about an hour's drive]. And i try to limit the portions so that there is no leftover. If got extras, i will share with my colleagues. They are now used to eating meatless/boring meals with me [steamed vege, fishes, brown rice, etc]. Yeah, I know reheating food too often is not good for health, but sometimes, too wasteful to throw away.. I only cook for two adults (and 1 fussy toddler, that one, tak kira), so it's kinda hard to cook ngam-ngam hou.. But will try to limit leftover food though.. Yes, pls try to limit leftover food. I know its difficult - my parents still cook for 5 although 3 of us have left the nest..lol. My oncologist told me to consume less processed food and prepare fresh meals, urgh.. so difficult as i have to work long hours and have a demanding daughter. home-cooked meal is always good. haha...good that ur hubby and son eat what u cooked. Well, I was 'trained' by my mum to eat what she cooks...I can survive any 'rubbish' food now...at least im not a picky eater. Good girl.. I dont like picky eaters.. Really pisses me off.. Just like Kz.. Sometimes I give up and just offer bribes such as sweets or chocolates in exchange of 5 mouths of rice.. Sometimes, a simple meal is the best meal ever! 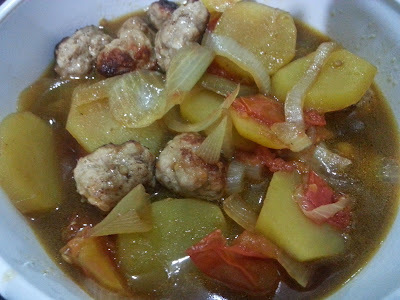 I like the potatoes with meat... my kids love that too.. so I often cook that one dish.. cook a lot so that they can eat and be satisfied completely.. potatoes can go well with minced meat, chicken, tomatoes.. yummy! 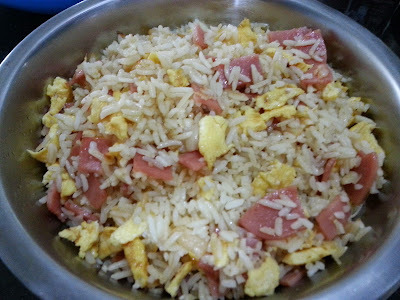 I like your fried rice with ham... must be very tasty with so much ham there.! 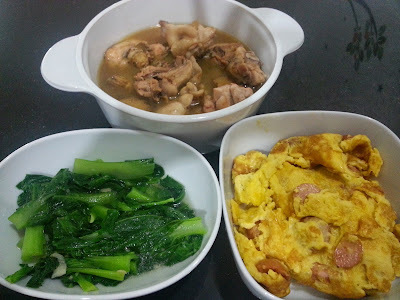 Yep, hubby seldom complains.. Like I said, "ngor chue mat, lei sek mat" (I cook what, you eat what).. Kz is still very picky, he seldom eats rice.. But he likes noodles.. That's why I HAD to make those store-in-jars-soup to keep for weekends to make noodles for him, else, I where got time boil soup on Saturday morning wor, alone at home with two kids.. Your comment made my day. Thanks! Some colleagues have been saying quite often that I shouldn't eat too much leftover food, else, will have cancer and what-not. Some mummies condemn my way of cooking for the kids (boiling soup on Thursday night and store them in jars to be used on weekends). It's really hard to say no to the MIL who gives us food to bring home on Saturday. Same to my mum when we go visit her on Sundays, and she gives us food to bring home too. Those food will be kept in the fridge, and we heat up to eat after work on Monday and Tuesday. On Wednesday onwards, we cook ourselves. So, we HAD to eat those leftover food (kak yeh soong) on Monday and Tuesday. I am thinking that the cancer part is where food is reheated in the oven using plastic containers. Always use glass/corningware/pyrex. I reheat using microwave too as it saves a lot of time. After come back from work really no mood to heat things up on the stove, I also know of people who eat healthy, live healthy and yet they get cancer. Genetics also play a huge part. Some type of cancer runs in the family. Food also is classified under carcinogenic food or not. I also don't know why people say in general leftover food causes cancer. If your leftover food is of good quality food, it is even better than eating out where we do not know whether the oil used to cook our meals are recycled oil from deep frying other things and what preservatives are added into the food. You are such a diligent wife to try to cook every meal for your family. If I am your spouse I will also eat whatever you cook with a smile. Good to know you bring your lunch to work too. Better this way than driving out with colleagues to eat whatever they want to eat. Morning mun.. Yes, mostly, I bring my own lunch. But once or twice a week, I will eat out with them. No choice, still must finish the leftover food first - from the MIL (who gives us food on Saturday) and my mum (who gives us food on Sunday).. Takkan say no meh, kan? This is mun here with my other id zmun2. I also eat lots of leftover food. I would be very happy if my mother or my mil gives us food during the weekend. As long as the leftover food is not carcinogenic food and stored properly to prevent bacteria from getting into the food, should be fine. I am not sure why your friends and colleagues said leftover food is not good, cause cancer and etc. Even if they eat fresh food but those food falls under carcinogenic food, will still cause cancer. And if eat outside, those stalls reuse those oil used to fry food, it is even worse. So you bringing your own lunch is a good thing. Hi mun, oohh, now you are permanently using your wordpress account ahh? Ya wor, many people say the same thing - leftover food not good/cause cancer, but you have a point.. They don't do their research properly I guess..
You are right Zoe dear.. Very agree with what you said.. 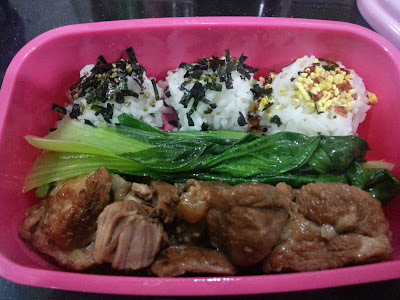 I always tell hubby 'you are so lucky to have a wifey who prepares breakfast for you, but you rejected my bento", haha..
Everything looks so yummy! Keep up the great effort! I love porridge too. Hair too short? Nah, it'll grow. Haha, so funny la you, talking about the hair suddenly.. Oh I feel it's just nice, not too short, but some friends commented it's too short.. Nevermind, it'll grow back..
No, not too short. Just nice. Your some friends have super long hair? If compare to my hair, yours is long long hair. So your rule same as Mango? : "Whatever I cook you swallow, where ever you go I follow" haha. Haha, I laughing now, drinking Milo now, almost choke..
Wah, this Bananaz very the creative, saja cakap also the sentence rhymes so well wor..
Bananaz loves 'yat wok sook' food that's why always love buffet rice at chap fun where all rice, vege etc. mixed together. That's the reason why will surely go for the 'yat wok sook' Bibimbap in Korean restaurant. Yep, yat-wok-sook is very convenient, just dump everything inside - potatoes, carrots, minced meat or whatever, add oyster sauce, kautim.. But of coz outside economy rice stall nicer la, they have "secret ingredients" added to make the food taste good, even if it's just steamed water egg, serious !! Actually porridge is not for poor people, whoever said that is really very rude. Porridge also can be very high class, ever heard of abalone porridge? Anyway, I don't see your meals simple wo, for me 'simple' is maggi mee, haha! Aiya, paiseh.. I eat overnight food mostly.. But tonight, I want to make it a point to cook.. I've taken out the minced meat and put in the fridge.. But it will be a simple meal. Minced meat with some veggies, and noodles, that's all..
Really? But from your posts, your mum always cooks more than 1 dish.. Looks very yummy too..
BTW, I never heard ppl say that porridge is for poor people, I thought it's for sick people! Oh yes, I arranged and decorated it like a bento just for fun, but actually it's just leftover rice with dishes (from the night before)..
Really? Porridge is poor people's food? Who is the fool who said that? I eat porridge almost daily hahaha! I like my millet porridge with carrots and miso and flaxseed oil. So yummy! That's my breakfast.